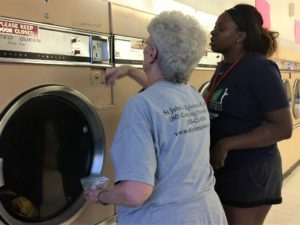 Laundry and Latte is a College Ministry started by St. John’s 9 years ago. 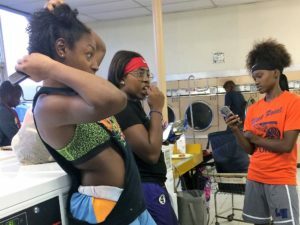 Looking for a way to help the college students at our local community college, Labette Community College, we decided everyone needs clean clothes. We provide, once a week, two free loads of laundry, wash and dry, to the college students. Along with dispensing quarters for the machines, laundry detergent and dryer sheets we provide coffee, hot chocolate (a favorite)hot apple cider or hot tea, all from our Keurig coffee machine, conversation and a listening ear. 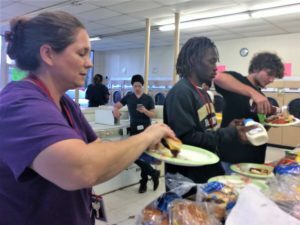 Once a month we have birthday treats and at the end of the school year we have a cookout at the laundromat. Our numbers vary week to week with our highest number of students in one 2 1/2 hour session being 31 and our lowest 1. Every year our numbers have been different with some averaging 22 a month and other years only 10. We are a dedicated few; Mother Sharon Billman, Verlyn Bolinger, Gary Chubb, Mike and Candy Scarborough and Martha Stone. The students are always grateful and we not only get to be around these energetic young adults but also the satisfaction of helping them. This Ministry has been suspended due to the condition of the Laundry Mat. May resume if someone buys and takes care of all the issuses.